If you have never heard of Wikki Stix - you're life as a mom is about to change...! 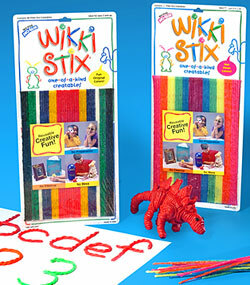 Wikki Stix are a nontoxic patented invention providing hours of imaginative no-clean-up fun for kids (and parents!). Part pipe cleaner, part modeling clay - Wikki Stix can be twisted and turned into anything! Compact enough to take just about anywhere (car, restaurants, doctors office etc. ), they can even go through the wash and come out just fine! !